Merlin Dura-Mesh Safety Covers consist of specially formulated polypropylene and nylon 2-ply webbing interconnected with a chemically and heat treated 5.6 oz polypropylene mesh. The webbing is connected to a stainless steel high tension spring with a stainless steel loop buckle. 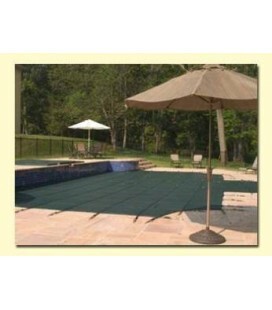 Dura-Mesh covers are available in green, black, blue and tan. Dura-Mesh covers are approximately 33% stronger than typical standard mesh covers. Merlin Professional Safety Covers meet or exceed ASTM standards ES 1346-91 for Safety Covers, when installed properly. The Dura-Mesh cover has a 15 Year Limited Prorated Warranty. Want to get swimming sooner? Our patented SmartMesh cover features a high-tech weave that allows water to pass through while blocking sunlight and filtering debris to 40 microns! Without sunlight, algae cant grow, so youll open your pool to cleaner water in the spring, maintain your pool with greater ease, spend less on chemicals and extend its life. 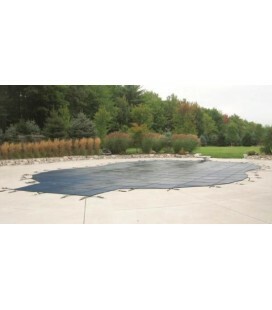 Its the cutting edge in cover technology the best choice you can make for your pool! 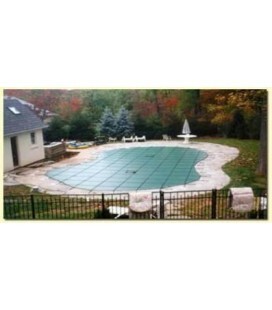 A cover thats custom-designed for your pool is safer and provides better protection. A Merlin safety cover is CAD-designed and custom manufactured to accommodate steps, angles, objects and unique configurations without on-site additions that could compromise quality and safety. Computer-Aided Design and expert craftsmanship delivers the best fitting covers in the business. Special Features. Specially designed step-riser kits and/or cable systems close up gaps and ensure security for pools with awkward angles or unique construction.